How Long is it Since you Picked up a Racket? Home > Getting Started > How Long is it Since you Picked up a Racket? There is no more unpleasant sight than watching a middle-aged paunch hanging over the top of a pair of 1970s high-riding tennis shorts. This vintage piece of clothing may have enhanced the reputation of Borg and Connors 30 years ago, but these days it represents the sartorial equivalent of a double fault. Thankfully, this is an increasingly rare sight on the court because tennis, alongside other racket sports, is not an arena where you tend to run into the near-terminally unfit. This discernible trend is probably as much down to the fact that you need at least two people to play as it is the need to be able to swing a racket with at least a modicum of technique and timing if you are going to make contact with the ball. No, racket sports trail badly behind jogging and cycling as the sport of choice for those exiting their local GP's surgery with a stern warning about modifying their "lifestyle".So rather than dusting off that trusty old school racket, most likely encased in one of those wooden presses that always appeared more at home in the dark recesses of the Spanish Inquisition than at courtside, people picking up exercise where they left off several decades before tend to make a beeline for the specialist running shop to pick up a pair of expensive shoes, or the out-of-town shopping mall for the flashiest mountain bike they can find. What a missed opportunity. Because while the newbie runners and riders are ploughing their lonely furrow around the paths of the local park, they could be engaging in a real sporting contest, one that will have their adrenalin pumping much faster as they attempt to outwit their opponent. Quite simply, playing racket sports is not only a much more exciting way to get active, but it's a lot more fun, too. Yes, it does help if you can manage to hit the ball without wrapping the racket around your neck, but you don't have to be hitting 120mph services or grunting like a wild boar every time you hit a groundstroke to get involved. The fact that you need at least one companion in order to play means there is the advantage of safety in numbers. 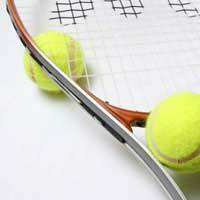 Rather than facing that uphill battle with self-consciousness that solo exercisers have to contend with before they've even closed the front door behind them, burning the calories on court is eased by the presence of your playing partner, especially if they are even more hopeless than you are! You never know, all those McEnroe-like strokes you remember playing on the school courts may come back to you sooner than expected. Never lost it? Maybe, if you ever possessed it in the first place, that is. One word of advice, though: lose the tight fitting shorts and join the 21st century. Even if the cascading paunch doesn't put off players on the adjoining courts, there is a good chance that you may hear the short, sharp sound of an ancient seam coming apart when you bend down to pick up a ball. That's not so much a double fault, as game, set and match.